In the episode Getting the Bird from the fifth series meat is in seriously short supply and Jonesey is getting desperate. Ever resourceful, Walker promises him off-ration supplies of pigeon though he is a bit cagey as to where he will get them. A bigger problem for the pair is where to keep the birds until Jones can dispatch them and Sergeant Wilson and Captain Mainwaring are somewhat baffled by the mysterious appearance of pigeons in the office bookcase. 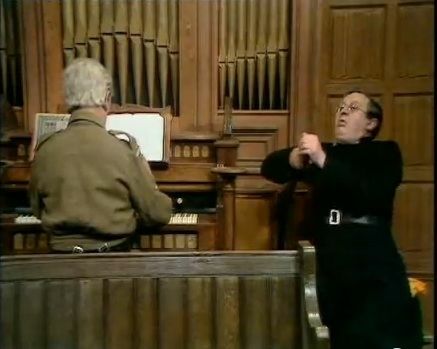 However the whole situation spirals badly out of control when Walker relocates them to the church organ pipes just in time for Jones to step in to cover the absent organist with a hearty rendition of Onward Christian Soldiers, which comes with extra feathers and scares the willies out of the verger. This entry was posted in blog on July 5, 2018 by wolAdmin.